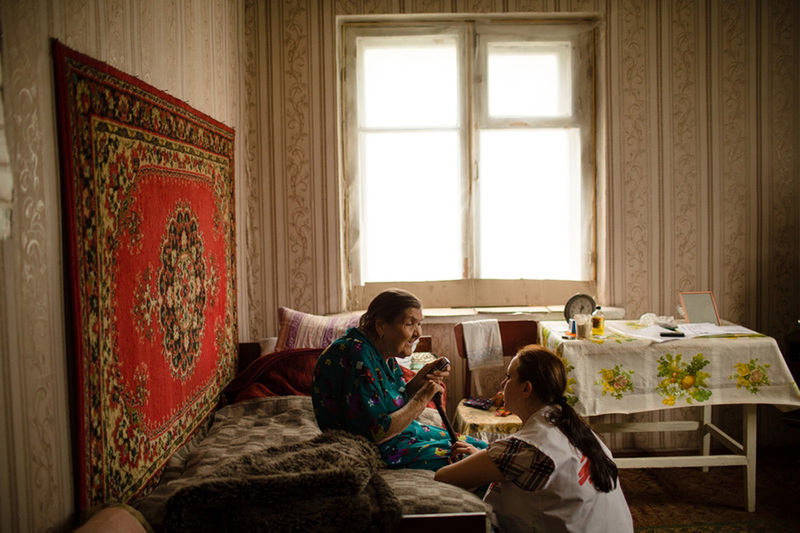 Monika Bregy is MSF’s mental health activity manager in eastern Ukraine. She manages a team of psychologists and translators working in the conflict zone offering vital psychological support to populations living along the frontline. There are people that have been living for more than three years in a conflict zone; spread out along the frontline, in isolated villages cut off from healthcare and public transport, or displaced from their homes and living in cities, such as Mariupol and Kurakhove. The majority of our patients are elderly people, especially women, who are not used to talking about their mental health because they want to appear “strong”. They sometimes perceive talking about their personal issues to be a sign of weakness. It can take a while until the feelings of shame decrease and people start to use our services more frequently. Then they tell us about their suffering; their isolation as the younger generation has often left, their grief, their acute anxiety and depression, and their psychosomatic symptoms – in which they present physical pains linked to psychological problems. I work with five psychologists to support communities in eastern Ukraine. We operate from mobile clinics, alongside a doctor and nurse, which provides primary and mental healthcare in areas where they are otherwise limited or non-existent. There are also locations such as Chermalyk, which our psychologists visit alone because the medical needs there are mostly covered; however, the mental health needs are huge and there is no other service available. The fifth psychologist works exclusively in those locations, mainly in Avdiivka and Krasnogorivka. We conduct assessments to understand the psychological support needs of communities. We ask about critical events that have happened and how people adapted to them or are still struggling with their impact. Vulnerable groups, their symptoms and needs are our focus. We consider quantitative and qualitative factors, such as the local perception of their mental health and expressions of emotional distress. In our initial assessment of Avdiivka, we found that people were experiencing changes in their thinking and mood, such as feelings of disappointment and hopelessness. Many of the people we meet have symptoms related to anxiety, psychosomatic problems and depression. These diagnoses are often inter-related and co-existing. In addition, some show trauma-related symptoms, such as recurrent, unwanted distressing memories, flashbacks and nightmares, or avoiding thinking or talking about a traumatic event, such as witnessing the deaths of people close to them or living among daily shelling. Many will have trouble sleeping, or will be easily frightened, irritated and angered. For those in need of individual support in maintaining and recovering their mental health, we offer one-to-one counselling sessions and teach techniques to better deal with their symptoms, such as breathing exercises and positive self-instruction. For example, we might ask a person to imagine what a close friend would tell them and then use this as a reinforcing statement they give to themselves. We help them to identify negative thoughts that can be replaced with helpful affirmations. We also use stress-reduction techniques based on mindfulness, which teach the patient to stay in the present moment by describing their situation and noting the aspects of their environment with all five senses. Last but not least, we always emphasise the importance of social contacts or rediscovering little, pleasant activities. Our psychologist works twice a week in Avdiivka. Avdiivka is an industrial town that has seen increased hostilities since January, and frequent shelling for many months. We work out of an abandoned kindergarten, with holes in the walls. The windows are covered with two types of film installed by our logisticians, one to protect against glass fragments in case of shelling, and another one on top of that to maintain privacy. In May 2017, our psychologists in Avdiivka began holding weekly group sessions for elderly people feeling isolated. In June, the team also ran training for local teachers, highlighting the importance of looking after their own mental health. They appreciated the positive effect a seemingly simple, few-minutes breathing exercise can have. From October, the team plans to start parent support groups, aiming at helping them with their children when coping with emotional distress. In villages close to the frontline, we are regularly told about the shellings and how people have to hide in the basements. In these extreme situations, children need to be calmed down, but adults are also very scared. The aim of the group is to offer a confidential space where experiences can be exchanged among people in similar situations, where they can find ways together to deal with their reactions. This is the main added value of the group – to let people know that, despite all the difficulties they face, they are not alone. When I recently supervised an elderly support group, I was touched to see how the participants cautiously expressed their fears and doubts at the beginning of the session and how grateful and noticeably more relaxed they were at the end. The sharing of emotions, the group exercises and the friendly atmosphere of the children’s drawings on the walls had contributed to an amazingly warm, friendly atmosphere. I’ll always fondly remember the moments at the end of the session, with participants laughing, sharing each other’s strength, taking pictures together and saying goodbye with tears of joy in their eyes.